The Coos Bay Rail Line (CBRL) is a short line railroad owned by the Port of Coos Bay. The Port acquired the rail line after its closure in 2007 to restore service to shippers that depend on the line to move goods to and from domestic and international markets. Access to intermodal transportation provides flexibility, which is crucial in supply chain management to ensure efficient reach while containing cost. Stretching north 135 miles from Oregon’s southwestern coast east to the Union Pacific Interchange Yard in Eugene. The CBRL provides the only link to customers to connect to the deep draft harbor at the Oregon International Port of Coos Bay. CBRL is vital to retaining rail service in the region and to enhancing the safety, connectivity, long-term efficiency, reliability, and cost-competitiveness of freight movements to and from the tri-county region. The CBRL offers rail customers a cost-effective, environmentally sound, and reliable source of transportation to national and international markets. The Port's access to international trade relies on its ability to transfer freight between oceangoing vessels and inland freight corridors. A healthy and vibrant railroad is a key element for existing and future movements of goods. Rail transportation remains as the essential means of moving freight, both within the state of Oregon and to points beyond its border. Safety is the top priority of the Coos Bay Rail Line (CBRL). With a pledge to utilize and enhance industry best practices, the Port promotes and integrates safety into all aspects of operation. The Port ensures its culture of safety through consistent training programs for staff and the public, ongoing investments in the infrastructure of the rail line, and seamless coordination with State and Federal regulatory agencies. The Port has invested over $60 million into revitalization of the rail line, with another $30 million in funding committed. Commitment to productivity and reliability, while ensuring the safe movement of cargo are essential elements in ensuring stable business growth for the Port and its customers – both future and existing. 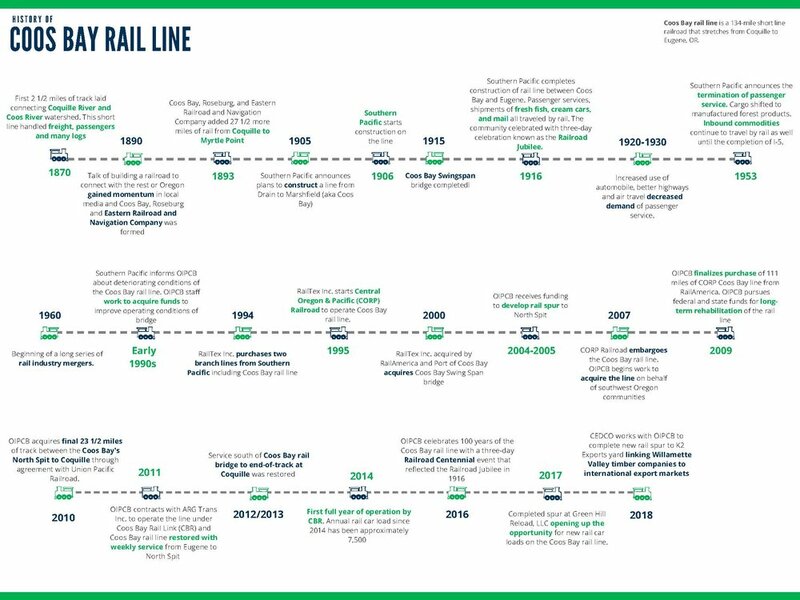 The rail line is an economic engine in southwestern Oregon, supporting direct employment of 1,000 people at rail served industries with family wage jobs. In addition, ongoing capital investments in infrastructure projects generate local job opportunities and support local businesses. The Port serves as a hub; connecting organizations, agencies, and communities. As the Port continues to grow, the Coos Bay Rail Line will continue to be an essential competitive edge. Freight rail transport is affordable, efficient and environmentally responsible. Each loaded rail car on the CBRL is equivalent to 3.3 truck loads which means freight transported along the rail line reduces roadway congestion, creates time savings for drivers, cut costs on highway maintenance and improves air quality. The rail line significantly reduces congestion along Hwy 101, Hwy 126 and Hwy 38 from I-5, removing approximately 25,000 trucks from the highway system on an annual basis and has removed the equivalent of an estimated 150,000 class 8 trucks off the road since the Port reopened the line in 2011. In addition, according to the American Association of Railroads, U.S. freight railroads can, on average, move one ton of freight a distance of 480 miles per gallon of fuel. This fuel efficiency translates to better air quality for the region. Rail reduces the amount of CO2 emissions released when compared to other modes of transportation. Since reopening the line in 2011, the Port has reduced approximately 21,000 short tons of CO2 from being released in the air if freight was diverted to truck. Using the EPA Social Cost of CO2 emissions of $11 per metric ton, this indicates a social cost savings of $209,000. EPA defines social cost as the measure, in dollars, of the long-term damage done by a ton of carbon dioxide (CO2) emissions in a given year. Moving forward, the Port is committed to the preservation of the environment by continuing to make environmentally sound infrastructure upgrades, using best management practices, and investing in technology that reduces environmental impacts of the line.